The 2018 West Chester Story Slam GRAND SLAM theme is announced! Tickets for the 2018 West Chester Story Slam GRAND SLAM are on sale now! The theme for the GRAND SLAM is Happy Days! This GRAND SLAM will take place at the Chester County Historical Society on Tuesday, November 13th at 8pm. The winning storytellers from throughout the 2018 season will compete for the title of Best Storyteller in West Chester on the big stage. This year’s storytellers scheduled to compete are: Diane Yannick, David Winston, Steve Clark, Paul Heck, Cynthia Angst, Patrick Carmody, Luanne Sims, Cathy Sikorski, Steve Kernaghan, and Ethan Tankel. Pleaste note there is no food and drink at this venue, so grab your dinner in town and then walk over. We will once again have our after-party at Side Bar. The GRAND SLAM has sold out in the past so please purchase your tickets soon by clicking HERE. Steve Kernaghan wins our "Panic Switch" Story Slam! 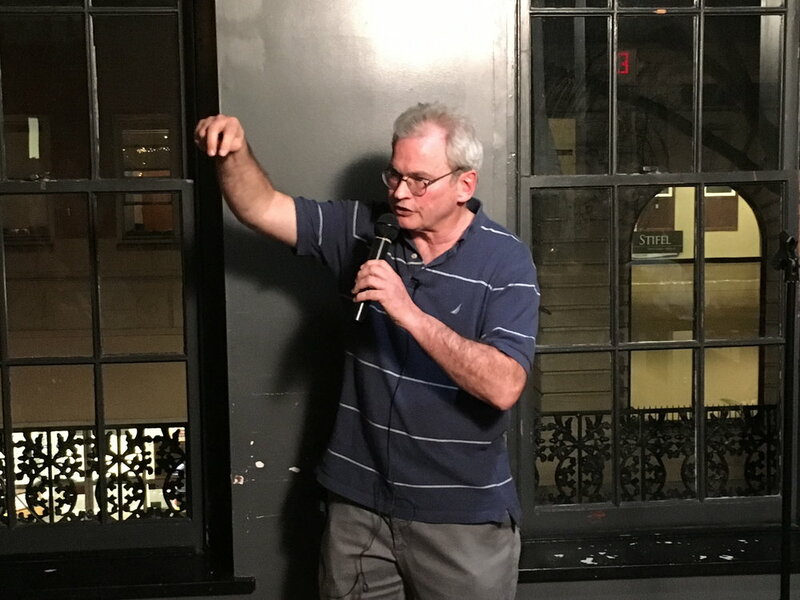 First-time storyteller Steve Kernaghan won our “Panic Switch” Story Slam with his tale of sharing an awkward situation with his students. Steve took home the prized pint glass and earned a slot in our 2018 Grand Slam, which will take place on Tuesday, November 13th. We heard some fascinating stories of panicked people tonight. We learned how a doctor relays surgery news to loved ones after the patient has caught fire. We heard about dealing with panic attacks with a therapist. We listened to a tale of panic while on an African safari, and tales of panic in a movie theater and a bus among other places. Thanks to all our storytellers, our judges and everyone who came out tonight. Our next Story Slam is themed Fright Night and will take place on Tuesday, October 9th. Grab your tickets by clicking HERE. Check out Steve’s winning story below. To watch other stories told on the night, click on over to the West Chester Story Slam YouTube Channel. Our September Story Slam is "Panic Switch!" Don't panic, but we have only two more regular season Story Slams this year! Our next Story Slam is scheduled for Tuesday, September 11th and the theme is "Panic Switch!" We start telling stories at 8pm, but most people arrive around 7 for drinks and dinner. Order your tickets now! We've all had moments of panic, sometimes unfounded and other times our panic is all too justified. Panicked moments occur while traveling, while driving, while planning a wedding, while watching kids play sports or perform at school plays. Some people seek treatment for panic attacks, others thrive on the adrenaline rush. Come out and tell your story on the theme "Panic Switch!" If you want to tell a story, see Jim when you arrive and we'll put your name in the hat! Grab your tickets for the September 11th Story Slam by clicking HERE. Luanne Sims Wins the "Family Feud" Story Slam! Luanne Sims won our "family Feud" Story Slam with her tale of an ongoing prank battle with her brother over the years. Luanne took home the prized pint glass and has earned a slot in the 2018 Grand Slam, which will take place in November. We heard stories about feuding siblings and irate dads, we listened to a tale of squirrel hunting and a story where dad really did turn the car around. We heard about an abusive stepfather and a mother who yells at her adult children. Thanks to all our storytellers for taking the mic and telling their family tales. Our next Story Slam is Tuesday, August 14th and the theme is "Sick!" Let's hear stories about being physically ill, mentally distraught, or as the kids say when something is wickedly awesome, "that's sick!" Grab your tickets by clicking HERE. You can check out Luanne's winning story below. Videos of the other stories told on the night can be watched over at the West Chester Story Slam YouTube Channel. Our July 10th Story Slam is "Family Feud!" Come on down for the Family Feud! That's the theme for our July 10th Story Slam. We start telling stories at 8pm, but most people arrive at Side Bar and Restaurant around 7 for drinks and grub. Pick up your tickets now by clicking HERE. What kind of stories are we looking for with Family Feud? We want to hear stories about sibling spats, paternal posturing and a mother's mayhem. We want to learn about your child's most infamous temper tantrum and your family squabble that erupted at the Olive Garden. Tell us about that political argument with your dad, the religious disagreement with your mom, or the flare up with your spouse. Perhaps your parents didn't react well when you came out, or got engaged, or moved away (or moved back in!) Has sibling rivalry destroyed your relationship with the family? Have you moved across the country to escape your family? Perhaps you married into a family without understanding what a hot mess they were. Grab your seats while they last! We also have some SRO tickets for the bar area available, which will allow you to make a quick exit if you see your mother in law at the show. Ha! Grab your tickets by clicking HERE! 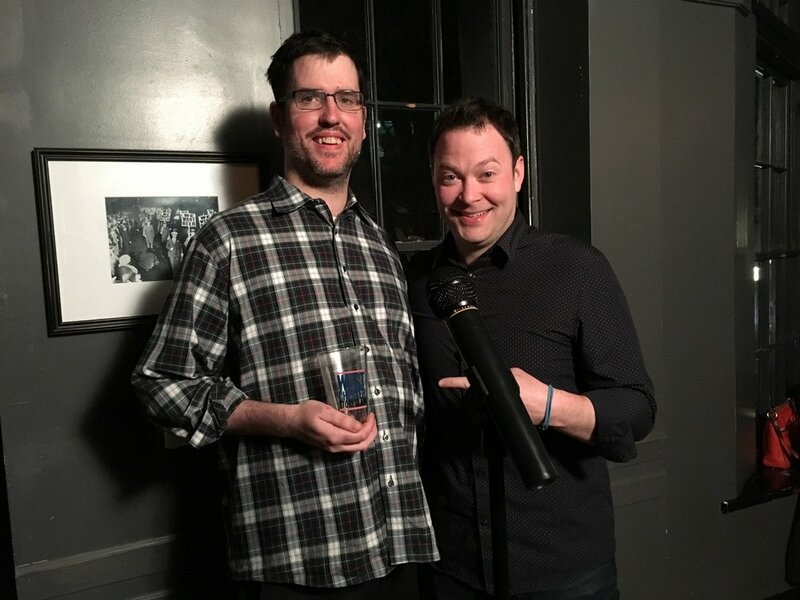 Patrick Carmody Wins The "Road Trip" Story Slam! What a long, strange road trip these people have taken! Patrick Carmody won our June Story Slam with his tale of a road trip to the Shop Rite! Pat won the prized pint glass and has earned a slot in the 2018 Grand Slam, which will be held in November. Mikey told us about a road trip to Atlantic City as a poor college student. Lorraine talked about reuniting with her father for a year and taking road trips with him before getting homesick. Dwight discussed the joys of changing travel plans at the last minute. Peter told us about a harrowing night on the road with his father. Paul detailed his summer trip as a chaperone that almost ended in disaster because of a Snickers bar. Jacque told us about how a road trip to West Virginia had her worried, but that it turned out to be good news. Shari told of how a pleasurable retreat turned into a nightmare. Thanks to all our storytellers, our judges, and all who came out tonight for a fun night of Road Trip stories. Our next Story Slam is Tuesday, July 10th and the theme is "Family Feud." For tickets, click HERE. Check out Patrick's winning story below. To check out other stories on the night, click on over to the West Chester Story Slam YouTube channel. Our June 12th Story Slam is "Road Trip!" Summer is Road Trip Season! We're dedicating our June 12th Story Slam to the Road Trip! So if you are in West Chester, purchase your tickets and come on out to hear stories and perhaps tell your own. Tickets for our "Road Trip" Story Slam can be purchased by clicking HERE. What constitutes a Road Trip story? We want to hear travel stories. Whether you were driving cross country in an RV or making a weekend road trip to the Jersey Shore, we're sure you have a travel tale. Perhaps your road trip consisted of airplane travel or hitchhiking or train hopping. What was the reason for your road trip? Perhaps you traveled to see the Grateful Dead, or to re-kindle a romance? Maybe you spent your road trip talking to auto mechanics instead of being on the road. Did you travel through Europe or South America? Have you road tripped to breathtaking sights? Have you been stopped at the border? Some road trips change our lives and others sometimes ruin our lives. Life itself is a road trip! Our Story Slams are held on the second floor of Side Bar and Restaurant in downtown West Chester. We start telling stories at 8pm, but most people arrive around 7pm for food and drink and the best seats. Grab your tickets HERE! Cynthia Angst wins our "Good Vibrations" Story Slam! 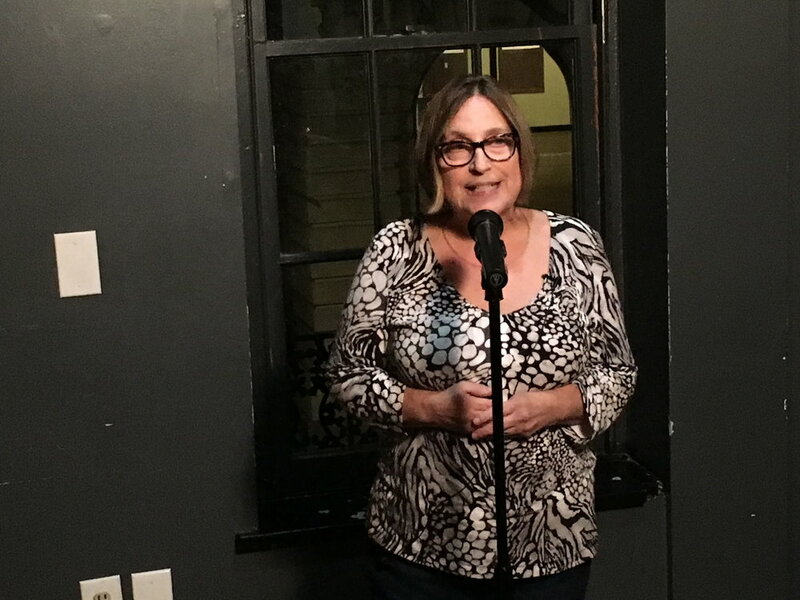 Cynthia Angst edged out the competition to win our May Story Slam with the story of celebrating her 50th birthday with "the coven." The theme for the night was "Good Vibrations." Cynthia took home the prized pint glass and has earned a slot in our 2018 Grand Slam, which will take place in November. We heard from five first-time storytellers tonight! We heard about overcoming fear after getting lost in the London Tube, and the joy of winning a softball season by mere chance. We heard about how dad communicates at a funeral, and how waking up to a bad vibe potentially saved a life. We heard about a bond between a daughter-in-law with her mother-in-law, that lasted well after divorce. We heard about how the Stanley Cup was nearly stolen, and how yoga class proved not to provide good vibrations. Thanks to our storytellers, our judges, and all who came out to enjoy the night. Our next Story Slam will be held on Tuesday, June 12th and the theme is Road Trip! For tickets click HERE. You can watch Cynthia's winning story below or click on over to the West Chester Story Slam YouTube Channel to watch all the stories told on the night. Our "It's My Job" Story Slam is Sold out! Thank you to all who purchased tickets for our April 10th Story Slam, which is themed "It's My Job." We have no more tickets available. We're looking forward to hearing your work related stories! While we start telling stories at 8pm, please remember most people with seats start arriving around 7pm for drinks and dinner. If you want to tell a story, sign up with Jim once you arrive and we'll put your name in the bucket! Tickets for our May 8th Story Slam, which is themed "Good Vibrations," will go on sale on Wednesday, April 11th. Our March 13th Story Slam is "Chaos!" We're celebrating "Chaos" at our March 13th Story Slam! Pick up your tickets and come on out Side Bar and Restaurant to hear stories - and maybe even tell your own. Our Story Slams start at 8pm, but most people arrive around 7pm for dinner and drinks. A few seats remain and we also have Standing Room Only tickets for the bar area. To order, click HERE. What is a Chaos story? Chaos is described as "complete disorder and confusion." We want to hear about that time you were caught up in a riot, or that time a brawl broke out in a bar. Tell us about that office job where nobody knew what the hell they were doing and the project turned out to be a mess. Describe being a lunch mom for your child's kindergarten class. Tell us about the challenges of organizing your wedding or that disastrous vacation where your flight was canceled. We want to hear about Chaos! Seats for this event will sell out, so order yours soon! See you in March! Our once a year Storytelling Workshop returns to West Chester on Wednesday night, March 21. This two hour workshop was developed for those who want to take the stage but are looking to learn the basics of storytelling. It's important to pre-register so we can send you videos to watch before the class. Learn more by clicking HERE. David Smith Wins the "Breathless" Story Slam! David Smith won our "Breathless" Story Slam with his tale of being a distraction in the classroom and the delivery room. David took home the prized pint glass and has earned a slot in the 2018 Grand Slam! Tonight's audience was rowdy from the get-go! From the introduction by our emcee Luanne Sims through to the final story, the storytelling fans cheered, laughed and at some points, were even left breathless. Thanks so much to our storytellers tonight. We heard stories of love and loss, cats and cows, torches and television celebrities. Our next Story Slam will be Tuesday, March 13th and the theme is "Chaos." Order your tickets by clicking HERE. You can watch David's winning story below. To watch the other stories told at our Breathless Story Slam, click on over to the West Chester Story Slam YouTube Channel!